In 2007 and 2008, food prices spiked, resulting in much higher U.S. grocery bills and far more hunger in the poorest countries as the global supply chain buckled. The world may now be on the cusp of a 2012 reprise amid the drought in the Midwest farm belt, the worst in 50 years. Luckily, there are plenty of simple, modest things Washington can do to alleviate and even prevent another crisis. The problem is that these fixes are opposed by a minor industry that adds little if any value to the economy, even counting its prodigious Beltway operations. Yup, the ethanol lobby strikes again. It can't succeed without a mandate that forces consumers to buy its product every time they fill up the tank, and if the resulting corn shortages drive food prices up in a way that punishes consumers around the world, so be it. On Friday, the U.S. Agriculture Department downgraded its 2012 corn forecast by 13% from last year's crop, to 10.8 billion bushels. That would be the shortest harvest since 2006, even though the acreage planted with corn rose 4% since last year and is the highest since 1937. Scorching temperatures and little rainfall have left only 24% of the crop in good or excellent condition in the 18 major corn belt states, down from 72% in June. These represent the largest month-to-month potential declines in grain yields since the USDA started to keep records. Also on Friday the USDA's world agricultural outlook board estimated that global corn consumption will be off by 38.9 million tons, with the U.S. problems responsible for three-fourths of the shortage. The gap is likely to presage climbing basic-food commodity prices. Corn futures are up nearly 50% over the last six weeks. The U.S. market is so important because the U.S. accounts for 60% of global exports, and corn feeds cows, pigs and chickens and is also a key ingredient in all kinds of foods. 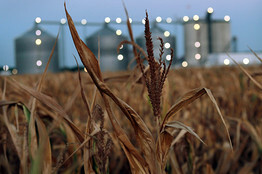 A field of dead corn sits next to an ethanol plant in Palestine, Ill. But not to worry, according to the ethanol lobby. On Friday the Renewable Fuels Association trade group put out a statement—apparently serious—claiming that there's no danger of an ethanol shortage and that "obligated parties under the RFS will have every opportunity to demonstrate compliance this year." Even prior to the drought, a growing roll of world leaders was looking on aghast at such special pleading and politely suggesting that maybe the U.S. might do something to avert another wave of food price shocks. The latest is United Nations Food and Agriculture Organization director José Graziano da Silva, who on Friday called for "an immediate, temporary suspension of the mandate" to "give some respite to the market and allow more of the crop to be channelled towards food and feed uses." It must have been a busy day for the ethanol propagandists. But then they're used to it. In 2010, the G-20 countries requested a consensus report from the various international agencies on how to better manage the risks of food price volatility after bread riots in two dozen countries from Brazil to Pakistan. The global bureaucracies—the WTO, FAO, IFAD, IMF, OECD, UNCTAD, WFP, IFPRI, UN HTLF and the World Bank—all signed on to recommendation six: "Remove provisions of current national policies that subsidize (or mandate) biofuels production or consumption." America's Environmental Protection Agency has the power to do just that. The Renewable Fuels Standard builds in "safety valves" in the event of extreme economic harm in states or regions or if the ethanol industry does not produce an adequate supply. A coalition of meat and poultry producers has applied for such a waiver. Our bet is that the EPA decides the drought doesn't qualify. Texas Governor Rick Perry applied for a waiver during the 2008 emergency—denied. President Obama could overrule EPA, but his willingness to do so would no doubt depend on how such a decision would affect his polling in Iowa and other ethanol states. He's already shamelessly playing up his support for wind-power subsidies in the Hawkeye State. 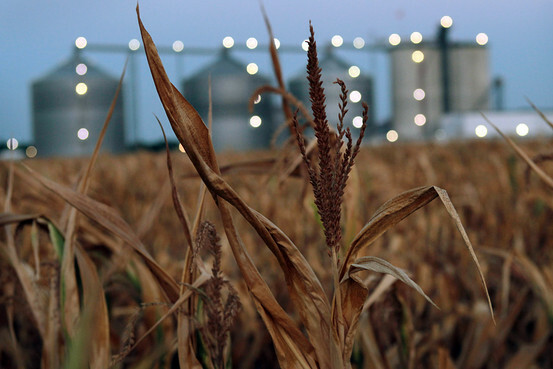 If not for the politics, the ethanol mandate would have been gone years ago. Oil costs and imports are up (ethanol makes up less than 1% of world-wide transportation fuel), and even the green lobby has turned against the fuel (because of the carbon-increasing deforestation it causes). For more evidence, consider the ethanol waiver requested by the hunger charity ActionAid and the free-market Competitive Enterprise Institute. Normally when making decisions, the EPA considers "impacts on human health," a nebulous measurement that it usually inflates to justify costly regulation. But the ethanol rules mention health only to minimize the danger, despite numerous peer-reviewed studies showing that biofuel mandates increase hunger and hunger-related diseases at home and abroad and contribute to tens of thousands of annual deaths. The EPA still hasn't responded on the merits. Natural disasters can't be controlled. Ethanol is a man-made disaster that could be stopped if the EPA or others in Washington cared for human health as much as they do power politics.